Bed bugs, which are wingless, parasitic insects, have made a huge comeback in recent years. With the development of DDT, they were virtually eliminated and almost nonexistent until the mid-90s, when pest-control companies began baiting (rather than spraying) for cockroaches and ants. As a result of this change in technique, bed bugs were no longer being killed along with roaches and ants. At the same time, immigrants from third-world countries, where resistant strains of bed bugs have developed, started carrying them into major metropolitan areas. Once fertilized a female will lay 1-6 eggs per day for the rest of her life (200-500 lifetime). Eggs are commonly laid within small cracks and crevices. It takes from 7 to 17 days for the eggs to hatch, depending upon the temperature. As soon as the nymph exits the egg, it is ready for a blood meal.The eggs hatch into nymphs which go through 5 instar stages before becoming adults. Each stage has to have a blood meal before molting to the next stage. Adult bed bugs are oval, wingless, about 1/4 inch long, and rusty red or mahogany in color. Their bodies are flattened, they have well-developed antennae, their compound eyes are small, and the area behind the head (the prothorax) expands forward on either side of the head. Bed bugs can go without feeding for 80 to 140 days; older stages can survive longer without feeding than younger ones. Inspecting for bed bugs can be a long tedious process. Bed bugs aren’t limited to beds, and the inspection shouldn’t stop there. They can live in almost any crevice or protected location. The best person to inspect for bed bugs is a qualified pest management technician trained in the biology and control of bed bugs. They can Hitch a ride or move around on furniture, clothing, purses, luggage. Contrary to belief the chances of spreading bed bugs by carrying them on your pants or shoes is very slim. They are very resilient. Nymphs can survive months without feeding and adults over a year. They are not associated with the transmission of human disease. In 70°F temperature and under optimal conditions, if 40 bed bugs are in a room on May 2nd, by November 2nd the population would increase to 5,905 bugs. They are low light feeders, feeding mostly in morning just as sun rises. Bed bugs are no more likely to infest filth, poverty, or substandard housing then a plus home. In severe infestation of bed bugs there may be a unique sweet and musty odor. 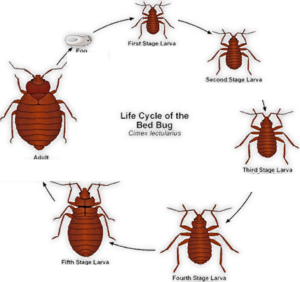 Eco Systems provides two options for treatment to control bed bug infestations Thermal Remediation (Heat Treatment) or Conventional Chemical Treatment. Both treatments are effective, with the thermal remediation having a few percentage points higher chances of success. You would need to talk to a trained Eco Systems representative to determine which treatment method is appropriate for your circumstances.